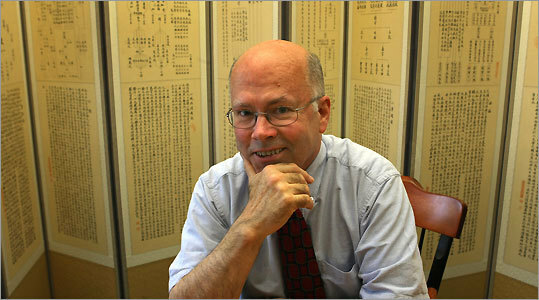 CAMBRIDGE - The class on writing Asian poetry that Professor David McCann teaches at Harvard includes units on Chinese quatrains, Korean sijo, and Japanese haiku, the last of which is so well-known that McCann’s students had haiku days in middle school. Why, McCann wondered, couldn’t the three-line Korean sijo that he loves enjoy the same widespread recognition as the three-line, 17-syllable haiku? With that, McCann, a poet and professor of Korean literature, embarked on a mission. He is the founder and chief marketing officer of a campaign to popularize the sijo (pronounced SHEE-jo), a traditional poem of 43 to 45 syllables whose third line contains a twist on the theme developed in the first two. This spring McCann hosted a sijo festival at Harvard - the first anywhere, he believes, to feature both Korean and English sijo. A sijo contest for middle and high school students which McCann judges attracted 450 entries from two dozen states this year, up from 160 in its 2008 inaugural year. Bo-Leaf Books just published McCann’s “Urban Temple: Sijo, Twisted & Straight,’’ one of the first anthologies of sijo written in English. The haiku whose success McCann and others seek to emulate gained notice in the decades after World War II as Americans grew curious about everything Japanese, from the tea ceremony to Zen Buddhism. “Haiku,’’ says McCann, “got to be part of American notions of what Asian was.’’ Jack Kerouac, who became an icon of the Beat Generation, wrote haiku. Now, McCann posits, Korea’s time has come. A so-called “Korean Wave’’ of exported television shows, movies, and musicians is attracting attention across Asia and beyond. “Winter Sonata’’ has been a TV hit around Asia, pop singer Rain has played Madison Square Garden, and Park Chan-wook’s “Old Boy’’ won the Grand Prix at the Cannes Film Festival in 2004. With its three lines, sijo resembles haiku, but the sijo poet has more room to develop a theme, narrative, or image before twisting and resolving it in the final line. Each line of 14 or 15 syllables consists of a string of four shorter phrases of three, four, or five syllables apiece. Modern Korean poets write sijo intending them to be read in print and sometimes link sijo as stanzas in a longer poem. Kim Dae Jung, who went on to become president of South Korea and in 2000 won the Nobel Peace Prize, wrote sijo while imprisoned in the 1980s. McCann carries the imprimatur of Harvard, but he is not the first American to try to do for sijo what Kerouac did for haiku. In 1992 a Florida poet named Larry Gross found sijo translations in a poetry journal published in India, and in 1996 he and Canadian poet Elizabeth St. Jacques founded Sijo West, a journal that printed about six issues. In 1995 Maplebud Press published “Around the Tree of Light,’’ a volume of St. Jacques’s sijo written in English. Soon McCann, who studied Renaissance history in college, was teaching English at an agricultural high school in Andong. One day he noticed an unusual volume in a local bookstore. Its cover was red, a taboo color in anti-communist South Korea, and it contained English translations of Korean poetry. Since then McCann has translated sijo and other Korean poetry himself. tank by the restaurant door. make peace and flee, escape with me! He’s been writing sijo ever since for the Every Other Thursday poetry workshop, and a year ago his fellow poets started composing sijo, too. He and Fenkl plan to create an online journal for sijo in English. Last year Fenkl, aware of McCann’s new cause, suggested a school-age sijo contest to the Illinois-based Sejong Cultural Society, which was founded in 2004 to promote Korean culture. The society sent 5,000 fliers to English teachers and principals in 20 states last year; this year it sent 20,000. Sixty sophomores at Trinity High School in Manchester, N.H., studied sijo this year, and a half dozen entered the contest. In Atlanta, teachers at the Marist School taught sijo to their 12th-grade world literature classes, and all 120 students submitted poems to Sejong.